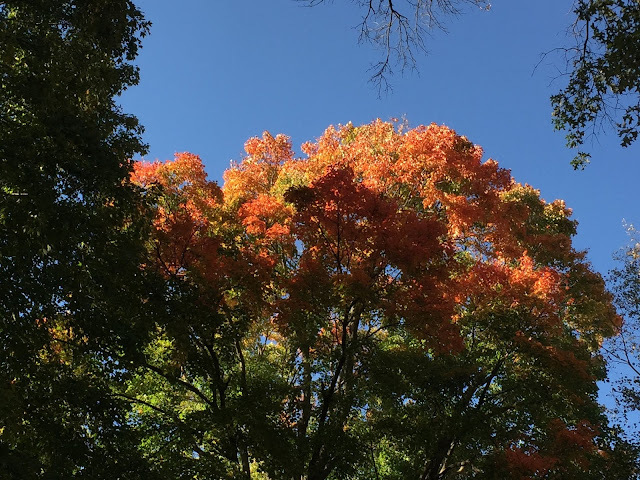 Flowering has just about ended in our gardens, but the fall color has just started, so here's a view of the tiptop of our 100'+ sugar maple as it just begins to color up. This is pretty much normal except about two weeks later than usual. The weather has flirted with frost, a couple of overnight lows in the 36-37F range, but now the weather has warmed and the lows are expected to be 10 degrees warmer through the end of October. It's very rare to end October without a frost. Thank you global warming. Word of warning: water, water, water, especially any new plantings, i.e., any added this season. Our fall drought is upon us, and plants should enter the winter well watered because winter is not so much a season of cold as it is a season of drought.